Livingston have been found guilty of breaking Scottish FA dual interest rules because of owner Neil Rankine's involvement with East Fife. But the governing body has deferred any punishment until another meeting on 13 February to hear further submissions from the Scottish Championship club. Livingston were found to have broken four SFA rules over Rankine's links with the League Two club. They can appeal but are unlikely to do so before the penalty is known. An SFA statement said the club had failed to act in good faith by not disclosing that Rankine, a shareholder of their parent company, Livingston 5 Ltd, also holds interests in East Fife. Rankine is also a former owner of Dumbarton and his links with Livingston's Championship rivals were also under investigation. but the charges were dropped. "The club is giving careful consideration to the decision of the judicial panel and hope that it can achieve a change of circumstances which will address the panel's concerns." Livingston were also found guilty of "providing false, misleading and/or inaccurate information in respect of Neil Rankine's eligibility as a fit and proper person" by not disclosing his interest in East Fife. "By holding interests in East Fife FC, through Neil Rankine, shareholder of Livingston 5 Ltd," the SFA disciplinary panel concluded, "Livingston FC holds power to influence the management or administration of East Fife FC." The panel said Livingston had therefore not acted in the best interests of Association Football. Rankine became involved in Livingston in 2009 when he and current chairman Gordon McDougall took the club out of administration. 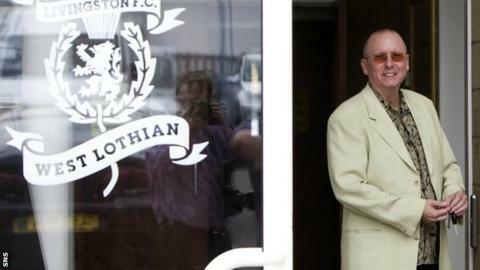 The SFA investigation came during a difficult period for the West Lothian club. Former Livingston director Ged Nixon went to court last month in an attempt to freeze the club's bank accounts over a claim of money owed, while the club were deducted five points for breaching SPFL rules relating to non payment of tax. Livingston had a ban on signing player lifted by the Scottish Professional Football League on 1 January after settling a case of undeclared bonus payments with HM Revenue and Customs. Meanwhile, manager John McGlynn left the club during December, with player-coach Mark Burchill taking over until the end of the season with his side bottom of the table.